Slightly larger than the other BMW sign on our website, this 24″ BMW sign is the standard logo look. The colors on the sign are black, blue, and white. 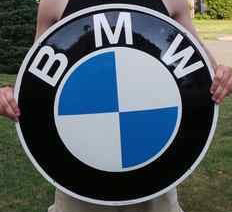 This is a great looking BMW Round Single Sided Porcelain Sign.